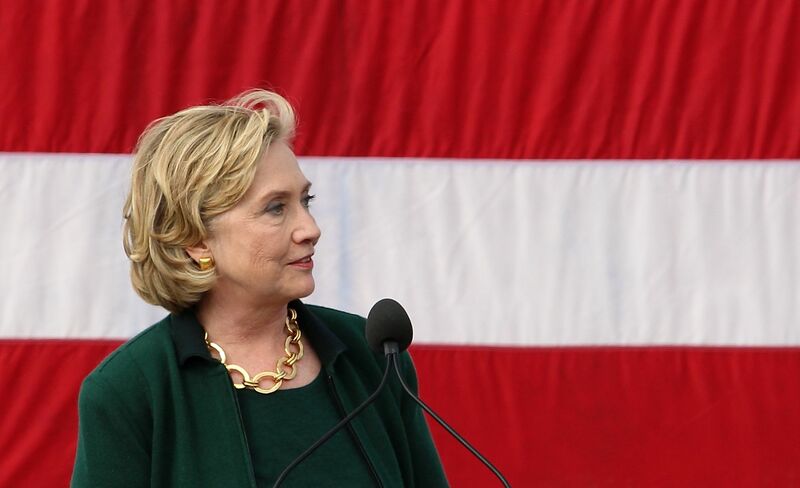 Hillary Clinton [2014 file photo]. Thank you so much Charlie. Thanks for your friendship. Thanks for your leadership. The Congress will miss you when you leave its ranks but I have a feeling that you are going to be spending a lot of time right here in Harlem. Charlie didn’t tell you the whole story. He was actually the person who called to encourage me to run for the Senate. He basically said that I had no choice. But it took me a long time before I realized he was right. He’s been a great friend and partner since then. I want to tell you how special it is for me to be back here in Harlem to make this set of comments. I loved representing New York for eight years. And Harlem looms large in the American imagination as the birthplace of so much art and culture and such vibrant public life. There’s really no place like it in the world. I appreciate being joined by the Governor and Sandra, by the Mayor and Chirlane, by the former Attorney General, Eric Holder, Representative Yvette Clark, and Representative Nydia Velazquez, our Council Speaker Melissa Mark-Viverito, Public Advocate Letitia James. I want to thank Dr. Khalil Gibran Muhammad, and to all of the New York State Black, Puerto Rican, Hispanic and Asia caucus members and members of the New York City council. The Black, Latino, and Asian caucus, I thank you all so much for being here. I want to pick up on what I just said about Harlem. Because Harlem and many other communities across America remind us that any view of Black America that focuses exclusively on crime, poverty or other challenges is missing so much. Missing the strength and the pride and the achievement that is evident on every street here. That narrative is missing the remarkable rise of the African American middle class, the rise of African American rise to leadership in all walks of life, in business, law, politics, science, the arts, sports and all the professions. It’s missing the vibrancy of the black church, the passionate advocacy of the next generation of change makers, and the service of leaders at every level, who never tire of making others lives better. Earlier today, I spent some time with the heads of nine of America’s historic civil rights groups, hosted by Marc Morial of the National Urban League, Reverend Al Sharpton attended. And we had a great conversation because they are working to drive a 21st century agenda for jobs and freedom. I am grateful for their guidance and wisdom. I am also grateful to be speaking in this building that honors two men who represent just some of the diversity of the African American community. Arturo Schomburg, who was from the Caribbean, and Langston Hughes, whose ashes are housed here, reminded all of us that when life ain’t no crystal stair, you’ve got to keep climbing. That’s a good lesson for everyone. But even as we acknowledge and even celebrate successes, it’s important to remember. There are still very real barriers holding back African Americans from fully participating in our society. That’s what I am here to talk about today. Last week on the debate stage in Milwaukee, I said I want to tear down all the barriers that hold back Americans, across racial lines, because our country can only live up to it’s potential when every single American has the chance to live up to theirs. So I want to talk with you about how we break down the barriers that disproportionately affect African Americans and build ladders of opportunity in their place. Last week, I went to Flint Michigan. By now, we all know what’s happening there. Families, children, babies, drinking poisoned water for nearly two years because their government wanted to save a little money. It’s a horrifying story, but what makes it even worse, is that it’s not a coincidence that this was allowed to happen in a largely Black, largely poor community. Just ask yourself, would this have ever occurred in a wealthy white suburb of Detroit? Absolutely not. And as we have learned more about this crisis, we’ve seen other barriers holding back the people of Flint coming into clearer focus. Years of underinvestment have left behind a hollowed out community without enough jobs or opportunity for the people living there. Not enough families have access to the quality education that their children deserve. And they have too little political power, which left them vulnerable to a state government that ignored and dismissed their concerns. Just imagine, every one of you a parent, a grandparent, an aunt, an uncle, going to the authorities holding a bottle of brown smelly water, telling those in authority, “There’s something wrong with this water. My baby has a rash. I feel funny when I drink it or take a bath,” and being told, “there’s nothing wrong with the water. Just go away.” Flint is not alone. There are many Flints across our country, places where people of color and the poor have been left out and left behind. Now in the contest for the Democratic nomination, we have spent a lot of time debating about the big banks and the excesses of Wall Street, and these are important issues and I am absolutely committed to ensuring that no bank is too big to fail and no executive too powerful to jail. But Flint reminds us there’s a lot more going on in our country that we should be concerned about. The truth is we aren’t a single-issue country. We face a complex set of economic, social, and political challenges. They are intersectional, they are reinforcing, and we have got to take them all on. So it’s not enough for your economic plan to be break up the banks. You also need a serious plan to create jobs, especially in places where unemployment remains stubbornly high. You need a plan to address the generations of underinvestment and neglect. Now even if we succeed on raising taxes on every millionaire and billionaire in America, and believe me, I do intend to succeed at that, we still need to face the painful reality that African Americans are nearly three times as likely as whites to be denied a mortgage. Something’s wrong when the median wealth for black families is just a tiny fraction of the median wealth of white families. And when gun violence is by far the leading cause of death for young African American men, outstripping the next nine causes of death combined, there is something deeply wrong. Something is wrong when African American men are far more likely to be stopped and searched by police, charged with crimes, and sentenced to longer prison terms than white men convicted of the same offenses. And when Black kids get arrested for petty crimes, but white CEO’s get away with fleecing our entire country, there is something wrong. 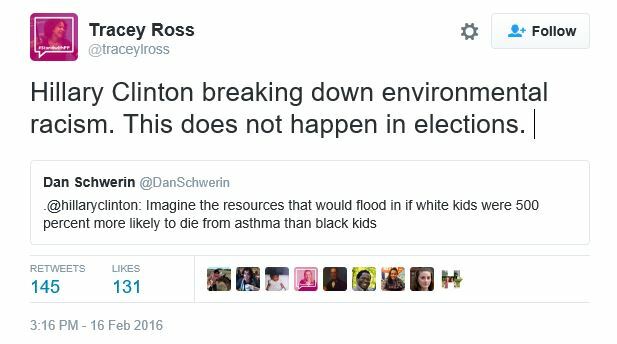 Just imagine with me for a minute, if white kids were 500% more likely to die from asthma than black kids, 500%. Imagine if a white baby in South Carolina were twice as likely to die before her first birthday than an African American baby. Imagine the outcry. Imagine the resources that would flood in. Now these inequities are wrong, but they’re also immoral. And it’ll be the mission of my presidency to bring them to an end. We have to begin by facing up to the reality of systemic racism. Because these are not only problems of economic inequality. These are problems of racial inequality. And we have got to say that loudly and clearly. Now I don’t by any means intend to imply that we are not still making progress. We do have a lot to celebrate as Congressman Rangel said. The people in this room know that you have helped to make it happen. And there is no better example of that progression than our president. And for all the partisan resistance President Obama has faced every day, remember and celebrate he brought our economy back from the brink of another Great Depression. On his watch, 14 million jobs have been created, health care has been brought to 18 million people, the auto industry was saved and so much else. Now, he would be the first to say, as we’ve heard him say, that despite our best efforts and our highest hopes, America’s long struggle with race is far from finished. For many white Americans, it’s tempting to believe that bigotry is largely behind us. That would leave us with a lot less work, wouldn’t it? But more than half a century after Rosa Parks sat and Dr. King marched and John Lewis bled, race still plays a significant role in determining who gets ahead in America and who gets left behind. Now anyone – anyone asking for your vote has a responsibility to grapple with this reality. To see things as they actually are, not just as we want them to be. I’d be the first to admit I don’t have all the answers. I’ve made my own mistakes. I’ve walked my own journey. But I believe with all my heart we can and must do better. We’ve made progress before, which gives me hope we can do it again. In the 1990’s, economic programs like the new market tax credit, the earned income tax credit, and empowerment zones like the one right here in Harlem made a real difference in people’s lives. They helped to create the highest increase in black incomes and the lowest black unemployment in history. We achieved record small business lending to minority owned businesses and record bank lending in minority communities. Right here in Harlem, the unemployment rate dropped by two-thirds, and we saw a drop in child poverty and an increase in employment and income for single mothers, too. We also learned about what doesn’t work. Some of what we tried didn’t resolve problems. Some ended up creating new ones, and the caused disappointment, frustration, even anger. So as we face today’s challenges, we have to bring all those lessons to bear. Here’s the bottom line as I see it: when we make direct strategic investments in communities that have been left behind and when we guarantee justice and dignity to every American, then we really can make progress, lasting progress, progress that will catapult us into the future. We can reduce poverty. We can build ladders of opportunity. So I’m proposing a comprehensive new commitment to equity and opportunity for African American communities. That means a real plan to create jobs. If I’m elected President, we will direct hundreds of billions of dollars in new investments to places like Harlem and rural South Carolina. Including 20 billion dollars aimed specifically at creating jobs for young people. The unemployment rate among young African Americans is twice as high as for young white people. Now we need to get young people working, developing their skills, unlocking the full extent of the contributions they can make to themselves, their families, and our country. We need to make sure we’re not only creating good jobs but connecting black communities to where the good jobs are. So we’ve got to be strategic about our investments in transit and infrastructure. And we need a real plan, including expanding access to capital to support black entrepreneurs, especially black women, who represent the fastest growing segment of women owned businesses in America. And while we’re at it, let’s finally ensure equal pay for equal work for women. That would benefit women of color most of all and would lift up an awful lot of families. And let’s go even further. Let’s follow Governor Cuomo’s lead and raise the minimum wage to help people get out of poverty. Now we need to support [inaudible], which has always been one of the surest ways for black families to build wealth. That’s why I have a plan that would, among things, help African-American families save for a down payment. We need to make sure every family also has access to quality pre-school. And I applaud Mayor De Blasio for what he’s achieved here in New York with his pre-K program. And please, help us reverse the dangerous slide towards re-segregation in our schools. Our schools are now more segregated than they were in 1968. That is appalling and we’ve got to fix it. We also have to make sure everyone who wants to go to college can afford to. And everyone with student debt can have that debt refinanced and take thousands of dollars off the burden that they are carrying! Let’s give tax credits to businesses that actually invest in training and in apprenticeship programs to help young people who don’t go for a two or four year degree. And my plan gives special support to historically black colleges and universities. The HBCU’s have produced some of the finest leaders in our country. And it’s not just who they graduated in the past, it’s the work they’re still doing today, often against great odds. And then finally and so importantly, we need end-to-end reform in our criminal justice system. Not half measures, but a full commitment with real follow-through. Now this is something we can talk about for hours. In fact I gave my first speech of this campaign in April not far from here, and it was about reforming criminal justice, because the inequities that persist in our justice system undermine our shared vision of what America can and should be. Our legal system is still, all too often, stacked against those who have the least power, who are the most vulnerable. And we’ve seen the toll it takes on families torn apart by excessive incarceration and children growing up in homes shattered by prison and poverty. We’ve got to get back to that fundamental principle that everyone in every community benefits when there is respect for the law and when everyone is respected by the law. That is the formula for building trust and cooperation and we need to not only acknowledge but fix the crisis of mass incarceration. Let’s finally, once and for all, eliminate the remaining disparity in sentencing between crack and powder cocaine. Let’s rebuild the bonds of trust between law enforcement and communities by creating more opportunities for people to actually interact with one another, to build relationships. Let’s the end the epidemic of African-Americans being killed by police or dying in custody. Now I think you know, because I sure believe, there are many police officers out there every day inspiring trust and confidence, putting themselves on the line to save lives. So let’s learn from those who are doing it right and apply those lessons across the country. Let’s make sure the Justice Department has the resources to hold departments like Ferguson’s accountable when they do it wrong. Again and again, something terrible happens and no one is held accountable. The deeply troubling pattern and we’ve got to break it. We’ve also got to do a much better job of helping people who have paid their debt to society find jobs and support when they get out. Up to 60 percent of prisoners who reenter society face long-term unemployment. That’s a recipe for hopelessness and repeat offending. My jobs plan would make significant investments in reentry programs for the formally incarcerated. In my faith, we believe in second chances. In America, we believe in second chances. Let’s give those chances to people who need our help the most. Let’s give them a fair shot, which is also why I will “ban the box” in the federal government. And I want to thank Attorney General Holder, who has been really in the forefront of making so many of these changes happen. And I also want to thank another great New Yorker, Attorney General Loretta Lynch, who is continuing the work for equity and justice! And let’s roll up our sleeves and get to work to dismantle the school-to-prison pipeline. It’s diverting too many African-American kids into the criminal justice system, instead of giving them the education they deserve. We’ve seen a significant increase in police involvement in school discipline, especially in schools with majority-black students. We’re seeing an overreliance on suspensions and expulsions. I’m sure many of us remember that horrifying video of the girl in South Carolina being thrown out of her desk and dragged across her classroom by a school police officer. A classroom should be a safe place for our children. We shouldn’t even have to say that, I don’t think. So today I’m announcing my plan to end the school to prison pipeline. It includes major investments in school districts that reform their discipline practices. We want districts to know, if they do the right thing, we’ll have their backs and we will dramatically expand support for guidance counselors, school psychologists and social workers. So instead of just labeling kids problem students, they can actually help kids with their problems and keep them in school! This is not just an education issue, this is a civil rights issue and we cannot ignore it any longer. The bottom line is this: we need to be sending our kids to college. We need a cradle-to-college pipeline, not sending them into court and into prison. There’s much more to do, if you go to my website, hillaryclinton.com, you can read our full agenda. Sometimes people make fun of me because I actually tell you what I want to do as president. I actually give you plans about what I want to do. I kind of think it’s my duty to help inform voters so that you can make a good decision! But I want to mention one more critical area: protecting that most fundamental of rights, the right to vote. Across our country, Republican governors and legislatures are erecting one barrier after another that make it harder for black people to vote. It’s a blast from the Jim Crow past and we need to call it for what it is. And in the past few days the stakes got even higher. Justice Scalia’s passing means the court hangs in the balance. Now the Republicans say they’ll reject anyone President Obama nominates no matter how qualified. Some are even saying he doesn’t have the right to nominate anyone! As if somehow he’s not the real president. That’s in keeping with what we’ve heard all along, isn’t it? Many Republicans talk in coded, racial language about takers and losers. They demonize President Obama and encourage the ugliest impulses of the paranoid fringe. This kind of hatred and bigotry has no place in our politics or our country. The president has the right to nominate, under the Constitution, and the Senate has the obligation to process that nomination. And I hope the Senate will start paying more attention to statesmanship than partisanship. And I hope that they will understand that we can have our differences, but let’s not go right after fundamental rules of how we govern ourselves. That’s a bridge way too far, my friends. Now I will appoint Supreme Court justices who will see the Constitution as a blueprint for progress, not as an excuse to try to roll back decisions going all the way back to Teddy Roosevelt, which is apparently what some of them would prefer to do! Now I suppose some people will hear what I’m proposing and think, “Well, she’s saying this because she’s in an election. But many of you in this audience know me and you know that these issues have always been part of my North Star. In my first semester at law school, a woman named Marian Wright Edelman came to speak on campus at Yale. She was the first African-American woman admitted to the Mississippi bar, a lawyer for the NAACP in Jackson, a friend of Dr. King before he was murdered, altogether a remarkable person. She talked about starting a Head Start program in Mississippi and using her legal education on behalf of poor children who were invisible to the rest of the country. Something clicked in my brain that day. Until I heard Marian speak, it wasn’t clear to me how to channel my faith and commitment to social justice to try to make a real difference in the world. But she put me on the path of service. I went to work for her at the Children’s Defense Fund. She sent me to her home state of South Carolina to take on the problem of black teenagers who were being incarcerated along with adults. And when I look back, everything else I’ve done, whether it was going undercover to Alabama to expose segregated academies and try to skip them of their tax exemptions, or running a legal clinic at the University of Arkansas, to represent inmates. That’s been — Thank you Hazel. That’s been part of my mission. Representing poor people through the Legal Services Corporation. It’s about making people’s lives better. And it taught me that even if you’re young and you don’t have a powerful job, if you work at it and you stick with it – you can make a difference. Thank you. You’re a great amen chorus, thank you. You know, to quote Dr. King, the time is always right to do right – no matter who you are. And when I had the great privilege of representing New York, I worked with members of our Congressional Delegation. We fought to bring investments and jobs to neighborhoods that needed them, to improve health care, to get cleaner air and water for low-income communities. One of the highlights was partnering with the organization, One Hundred Black Men. To create the Eagle Academy. Which has been so successful. It’s grown to six schools now in New York. Taking young African American and Latino men. There was always something to be done and I had so many partners here in New York. We championed reforms to probation and drug diversion programs. We promoted specialized drug courts and juvenile programs, coming full circle with the work that I had done for Marion. So when I decided to run for President, I knew these issues had to be at the heart of my campaign. That’s where they’ve always been, that’s where they will always be. And I want to add something else, we Democrats have a special obligation. If we’re serious about our commitment to the poor, to those who need some help, including African Americans, if we continue to ask black people to vote for us, we cannot minimize the realities of the lives they lead or take their concerns for granted. You know, you can’t just show up at election time and say the right things and think that’s enough. We can’t start building relationships a few weeks before a vote. We have to demonstrate a sustained commitment to building opportunity, creating prosperity, and righting wrongs. Not just every two or four years. Not just when the cameras are on and people are watching, but every single day. So here’s what I ask of you, hold me accountable. Hold every candidate accountable. What we say matters, but what we do matters more. And you deserve leaders who will do whatever it takes to tear down all the barriers holding you back and then replace them with those ladders of opportunities that every American deserves to have. I’m also asking all Americans to join in that effort. As Cornell Brooks, the new head of the NAACP said in our meeting this morning – none of this is a ‘they’ problem, it’s a ‘we’ problem, and all of us have to admit that. And you know what, it is not an urban problem, it’s an American problem. Ending systemic racism requires contributions from all of us, especially those of us who haven’t experienced it ourselves. White Americans need to do a better job of listening when African Americans talk about the seen and unseen barriers that you face every day. We need to recognize our privilege and practice humility, rather than assume that our experiences are everyone’s experiences. All of us need to bring our skills to bare, and especially young people coming up today. Who have a passion for social justice and are helping to create new ways to solve intractable problems and we all need to try as best we can to walk in one another’s shoes. Imagine what it would be like to sit our son or daughter down and have the talk. Or if people followed us around stores or locked our car doors whenever we walked past. That kind of empathy is critical. It’s what makes it possible for people from every background, every race, every religion to come together in this great city, and to come together as one nation. It’s what makes a country like America endure. You know I started my remarks by talking about Flint. I’m going to keep talking about Flint until the families there get the help they need for as long as it takes. But there’s another side to the story of this tragedy. It’s the story of hundreds of union plumbers from across the country travelling to Flint to install water filters for free. It’s students at universities all over the Midwest raising funds for water deliveries and student athletes showing up in Flint to distribute supplies. It’s the United Auto-Workers and General Motors donating millions. It’s money pouring in to organizations where people are donating, if you wish, to try and help the kids and the people of Flint. And I’m grateful to everyone who has responded to our request sent out to our campaign. And it’s the story of that Kindergartner in Wilton, NH who lost his first tooth just a few days ago. The tooth fairy left him five dollars. I got a dime, I don’t know about you. And he said to his mother, I want to give it so those little kids can have water. His mom say right down and wrote me a letter about it. To me, that’s the best of America and it keeps me going. That sense we are all in this together. We all have vital contributions to make, and that when we come together, all of us, with a sense of shared purpose and shared humanity, we can solve any problem we face. And we can heal any divide, we can build a future that is far, far better than our past. That is my hope for our country, that is my goal for this election and I promise to keep fighting right alongside all of you, every day to make the United States a place where all men and all women are treated as equals, just as we are, just as we deserve to be. That is my hope for America. Thank you all very much.